Species distribution data provide critical baseline information for conservation planning and decision making. However, in many of the Earth’s most biodiverse regions, such data are lacking for many species. Here, we used ecological niche modeling and connectivity analyses to model distributions of endangered species and protected area connectivity across the Upper Guinea Forest (UGF) Global Conservation Hotspot of West Africa. We estimated the current distributions of African forest elephant Loxodonta cyclotis (Vulnerable), western chimpanzee Pan troglodytes verus (Critically Endangered), and pygmy hippopotamus Choeropsis liberiensis (Endangered) across the region and optimized connectivity in two main forest complexes in the region. We used occurrence data for the period 2010–2016 for the three species from two well-sampled national parks in Liberia (Sapo National Park and Gola National Park), and remotely sensed MODIS enhanced vegetation index data for the period 2010–2015. Our models predicted a total of 75,157 km2 of suitable habitat for chimpanzees in the region, 79,400 km2 for elephants, and 290,696 km2 for hippos. Of these areas, for chimpanzees, 30% of the area predicted falls within the boundaries of proposed or designated protected areas, and likewise 30% for elephants, and 19% for hippos. Liberia had the largest blocks of contiguous forest suitable for these species compared to other countries in the region but this forest was largely unprotected. This study identifies priority areas for biodiversity conservation and forest connectivity in the region, and reemphasizes the practicality of these tools to optimize conservation planning and implementation. 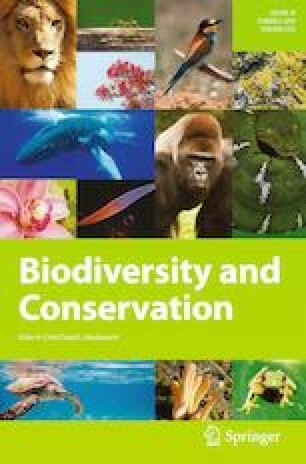 This study was made possible by the contribution of data from Fauna & Flora International, Liberia (FFI) for Sapo NP; the Society for Conservation of Nature in Liberia (SCNL), Conservation Society of Sierra Leone (CSSL), and the Royal Society for the Protection of Birds (RSPB) for Gola forest in Liberia and Sierra Leone; and Wild Chimpanzee Foundation and the Pan African Programme at the Max-Planck Institute for other parts of the region. We are also very grateful to developers of the APES database (http://apesportal.eva.mpg.de/database) for providing access to these datasets. Finally, we are thankful to the participants of KU-EEB’s spring semester (2018) scientific writing working group class for critical reviews of previous drafts of this manuscript, Daniel Jiménez-Garcia and Lindsay Campbell for their advice on processing remote sensing data, and Luis Osorio for writing the R script used in the MOP analysis.